After an extra alarm fire ravaged Chicago’s Shrine of Christ the King church in the midst of a restoration in October, the soaring 1923 house of worship’s future looked perilous. 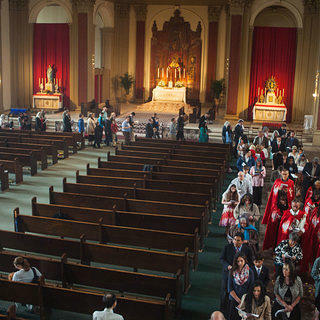 The city’s archdiocese revealed in January that it planned to move forward with demolition, and, despite headline-making fundraising efforts, a demo permit was granted a few weeks later. But preservationists and residents of Woodlawn, the struggling south side Chicago neighborhood where the church has stood for nearly a century, didn’t give up. In February, the archdiocese changed course and the shrine was deeded to the Institute of Christ the King Sovereign Priest, which will stabilize and eventually restore the building to its former glory. As of this writing, Phase 1 restoration plans have been drafted and more than $1 million has been raised. The Coalition to Save the Institute of Christ the King Church was one of the major players in this preservation victory. We caught up with Emily Nielsen, the group’s 26-year-old spokesperson, to learn more about the roller coaster effort it took to keep a piece of historic Chicago standing. How did you get involved in this effort? I actually go to Mass there. It’s my primary parish and I think I’m their only parishioner who works in historic preservation. Also, both my parents are on the National Trust Council which has really helped because the National Trust has been so supportive. Everyone at the Chicago field office has just been incredible. Local preservationists had already once saved the shrine from demolition after a fire damaged it in 2003. How did the coalition form? It was something of a shock, the announcement [that the church would be demolished]. The announcement came the first Sunday of January. On the Institute of Christ the King Sovereign Priest’s website, there appeared an announcement that repairing the church would be cost-prohibitive and therefore the archdiocese will move to demolish the remnants of the structure without delay. That was it. The Landmarks Commission meeting a few days later was interesting because all these different groups who had come together showed up, but we didn’t know each other. A lot of Woodlawn and Hyde Park neighbors came. Ward Miller with Preservation Chicago spoke and Lisa DiChiera from Landmarks Illinois spoke and the incredible thing about them is not only their organizations but the two of them as people are the ones who saved the Shrine from demolition by the archdiocese in 2003 [after a previous fire]. In 2003, I was living in New Orleans and I was 14 years old, so I was not involved, but, of course, I’m hugely grateful to those preservationists. There wouldn’t have been a shrine for us to save in 2016 without what they did. So, most of what the people who became players were present at the Landmarks Commission meeting and what I did (because I do write grants for historic preservation) was send an email to Ward and an email to Lisa. I said I was a parishioner of the shrine, that I wanted to thank you for being present at the Landmarks Commission meeting and that I know that any successful effort would involve the preservationists and I was wondering if you had any advice for me on what we could do? Then they started putting me in touch with people. At least at one point, our highest concentration of signatories of our petition came from Hyde Park. People there recognized that this building right near them is important. 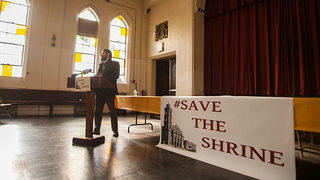 The editorial board of the Chicago Maroon, the University of Chicago student newspaper, wrote in support of saving the shrine. That to me really conveyed that the University of Chicago Hyde Park community recognizes this building as important to its cultural history. They aren’t in this for any kind of religious reasons; they really get the community importance. It made me happy; I felt like we communicated a really successful, positive message. The local community had realized that it needed to save the shrine to save its cultural heritage. It was just a few weeks ago that the archdiocese granted the demolition permit, and now they’ve come out and deeded the building to the shrine. What do you think changed their mind? The archdiocese did meet with the priests at the shrine on a pretty regular basis, but that was all confidential, so the coalition really had no idea what about was going on. I wish I knew what swayed them. I think we did everything we could think of to try to convince them that saving the shrine was best for everyone. They too came to that conclusion in the end. We tried to exert pressure in every way that we could think of, so the pledges made to Preservation Chicago by incredibly generous donors whose pledges reached $450,000 in early February, which was our estimate for the stabilization. We got to that level of pledges and thought that if we could tell the city of Chicago that funds are in place to stabilize this building, the stabilization would remove the safety concerns. So we had a press conference and that was a very positive event that got a lot of press coverage. But then nothing really happened. We sort of hoped that the archdiocese would say, “Great! We’ll spend your money.” But that didn’t happen. And then they got the demo permit. We started planning a fundraising video two days before and were going to try to do it what we thought was really quickly, in a week. Then they got the demolition permit and we thought, okay, we have to launch this as fast as we can. So we actually ended up producing the video in just a few days, which was one of those things you look back on and think, how did we do that? I think the video was able to reach so many more people than we had up to that point in time. Why would you say the shrine is so worthy of saving? It’s a hard question to answer because there are so many reasons. I think for me the first one is it’s a stupendous building. It’s gorgeous. And when you’re standing right there next to it, it’s simply magnificent and uplifting. 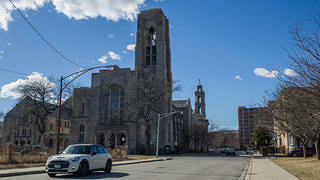 Chicago is certainly blessed with a great tradition of church architecture across denominations. But I can’t think of any church that’s more beautiful than the shrine. Then there’s the historical value recalling a time when Woodlawn was very different and booming in the 1920s. You can see that in the 1920s, Woodlawn was very affluent really, so keeping these great buildings shows the history but also now draws people in. There has been a lot of improvement in Woodlawn over the past decade, and a lot of nearby residents credit the shrine as a part of that. Great buildings do draw people into places where other drawbacks might keep them out. Keeping the great buildings is important for Chicago’s history but also for drawing people to neighborhoods that need investment. You’re 26 years old. There’s a misconception that most preservationists tend to be a lot older than that. You mentioned that University of Chicago students also voiced their support for this effort. Why would you say this effort matters to young people in particular? The thing with this effort is, if you lose this building, it’s gone. We are not getting it back. And I think that urgency can speak to young people. Professional preservationists have been just outstanding and they’ve all prioritized this project, which I think speaks to the value that they saw in this project. But they all have multiple other projects going on. But other than the professionals, everyone was a volunteer and one of the things I noticed was that people with school-aged children have very limited time, so what we then had was this dynamic where most people knocking themselves out for this on a volunteer basis were either in their twenties like me or their children had already left home. So there was this two-tier age dynamic. It was interesting to see those groups working together in a very positive way. Young people, we can have an energy and we can have a “not being beaten too many times before [mentality],” which can help. Our percentage chances of saving this building were not good in January, so to have people have that kind of hope and energy that’s often associated with the young made a big difference, although, I’ve got to say, a lot of our older volunteers poured a lot of hope and energy into this, too.